A commercial real estate developer and mortgage broker from Escondido admitted his role in a $50 million securities fraud scheme Thursday. Bradley Holcom, 55, pleaded guilty in U.S. District Court in San Diego, admitting that he committed wire fraud in connection with the sale of millions of dollars in promissory notes which he sold to investors throughout the country. 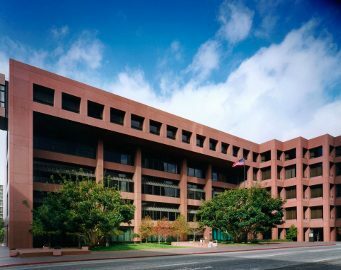 Federal Court, San Diego. Photo credit: casd.uscourts.gov. As part of his plea, Holcom admitted that his conduct caused approximately $50 million in losses to more than 50 victims. He faces a maximum of 20 years in prison when he is sentenced July 25. According to court documents, Holcom solicited investors to provide funds for the development of land for commercial and residential purposes through what he called the Trust Deed Investment Program. Holcom admitted that he falsely told investors who purchased notes through his program that they would receive a first-position lien on a specific piece of property he was developing. However, the defendant never provided investors with a lien and instead conveyed to investors a lesser interest that did not allow them to directly foreclose on the property to protect their investment. In addition, Holcom admitted that while he promised investors that their purported lien would be in first position, he subsequently solicited investments for properties that he knew were already encumbered. According to court documents, Holcom also sold properties that were supposedly serving as the security for investors without informing them that the property that had financed for development was gone. Holcom admitted that in 2008 and 2009, even though his financial condition had seriously deteriorated, he continued to solicit investors for new funds by making misrepresentations about his true financial condition and the manner in which he was using investor money.